We’ve heard it said among our many customers and clients in the past that long before they made the choice to get their hands on our top quality artificial grass, they hesitated, not knowing if the artificial turf would match their garden. It’s a common concern, and we don’t think we need to point out just how important the aesthetic appeal of the garden can be. You don’t necessarily have to have much of a green thumb to know where we’re coming from, either, though it only takes one look into how fantastic a garden’s aesthetic can be when fitted with artificial grass to know that investing in what we have to offer here at Great Grass is a smart move. We have a stunning variety of gorgeous looking artificial grass products on offer here at Great Grass, with all of our products featuring a wealth of different pile heights, textures and appearances to suit just about any garden. 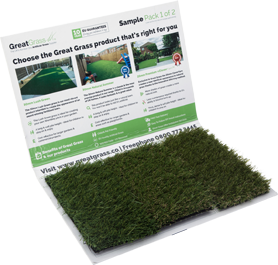 Whether you’re looking for something truly luxurious, with long blades of grass perfectly simulating a lush but well-kept meadow, or you’re more interested in a very neatly trimmed, sporty product with shorter blades, you’re sure to find precisely what you need when you invest in our artificial grass. And what’s more, with incredibly low maintenance qualities, purchasing artificial grass means that you’ll be getting your hands on a lawn that’s evergreen all year round and does away with tedious chores instantly. You’ll be able to relax knowing that you won’t have to constantly break out the mower, and you should find yourself with a lot more time on your hands to focus on the aesthetic of your garden like never before! If that sounds like just the thing you’ve been looking for, give us a call! You’re always guaranteed nothing but the very highest quality artificial grass no matter what product you choose to invest in here at Great Grass, and you’ll certainly be getting your hands on a lawn that will make your garden look absolutely stunning all year round. Make sure you don’t wait to get in contact as soon as you can, as we’re always at the ready to help.